What Could Travis Preston Do With a 250 (or 450)? As I sat in the stands last Saturday night in San Diego watching the 125 main event, I saw Travis Preston get another mediocre start, and work his Honda CR125R into second place. Although Preston dispatched the remainder of the field rather quickly, Kawasaki’s Bubba Stewart had already checked out. I noted the gap between Stewart and Preston (now in second place) and checked it throughout the remainder of the race. Sure enough, Preston was able to maintain Stewart’s pace — even narrowing the gap about two-thirds of the way through the 15-lap 125 main. With a couple of laps to go, Preston seemed to give up the chase and accept his fate . . . second place, again. Travis Preston can’t buy a good start. I don’t think it has anything to do with his starting technique, but everything to do with his size. He is just too big for a 125. On the victory podium, he towers over announcer Jamie Little — an attractive young lady who stands approximately 6′ tall. Honda’s racing site states Preston is 6’3″, 190 pounds (and this is before he even gets his gear on). Preston raises this same issue in a Cycle News interview published last week. 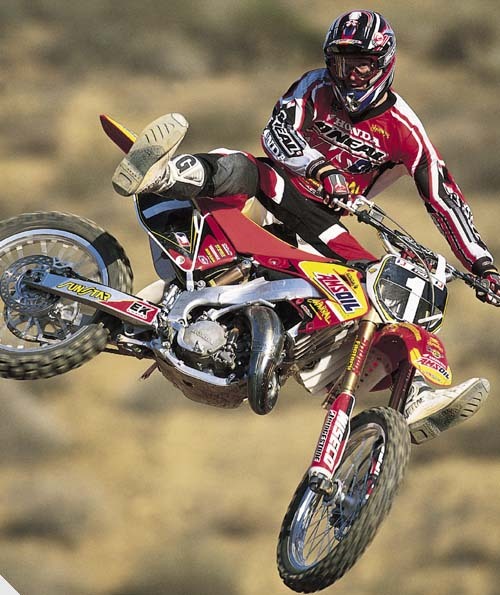 Basically, from my perspective, if Preston can run the pace of Bubba Stewart on a 125, he might be rather amazing on a 250 (or a 450 four-stroke). We will get the chance to see Preston ride a bigger bike in the next round, as the series moves to the East Coast (and the Eastern Regional 125 championship).